Show admin bar on AMP pages by default. Use a forked version of admin-bar.css from core to utilize :focus-within instead of relying on jQuery to toggle hover classes. Add setting for turning off admin bar in AMP responses, since the admin bar may cause the total CSS to exceed 50KB, in particular Twenty Fifteen. Add link between AMP and non-AMP versions when on non-native. Show actual validation errors when viewing admin bar in AMP. Show warning emoji when there are sanitized unaccepted validation errors. Add missing recognition for media attribute on style elements. Fix handling of !important transformations by inserting higher-specificity rules adjacent to their original rule instead of appending to the very end of the stylesheet. Automatically tree-shake obsolete IE6/IE7 CSS selector hacks. * Add forked version of WP 4.9.6's admin-bar.css with fixes for AMP. * Fix positioning of admin bar with sticky nav in Twenty Seventeen. It's great to see the admin bar on AMP URLs! This is a big step in usability. It's great to have the admin bar enabled by default, with this checkbox to disable it. * Link between AMP and non-AMP versions when on non-native. 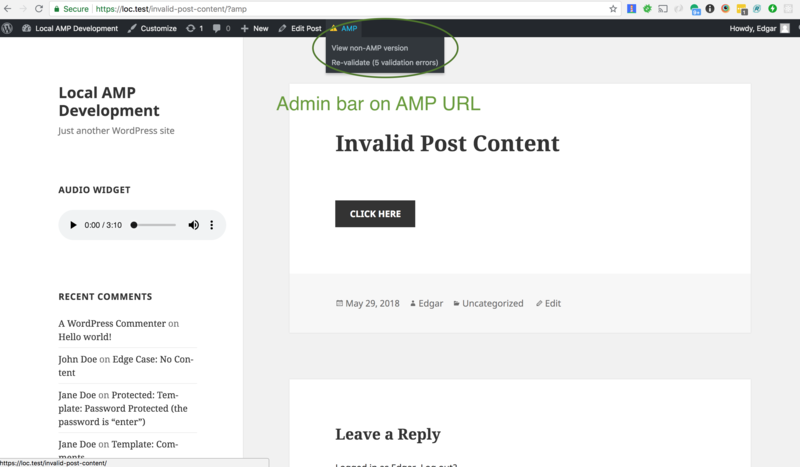 * Show actual validation errors when viewing admin bar AMP. * Show warning emoji when there are sanitized unaccepted validation errors.